I have reduced the search for you and presenting the latest free music HTML website templates for you. 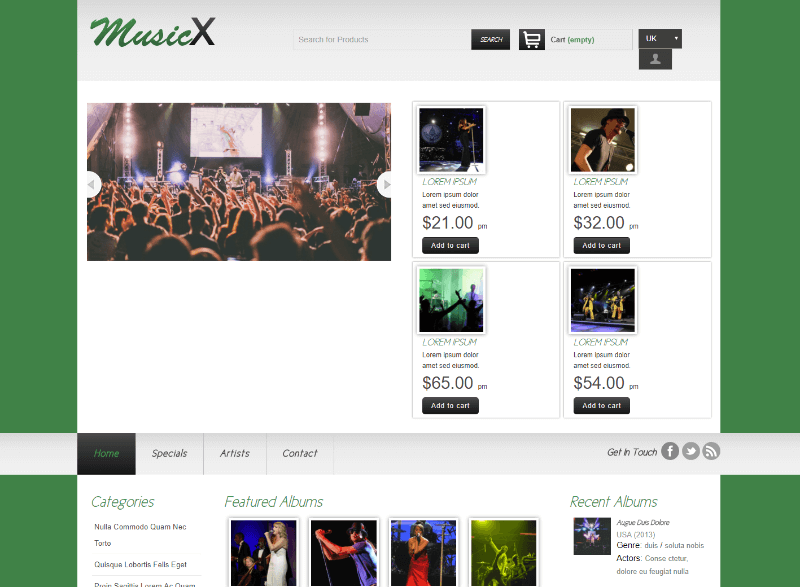 These are clean, beautiful, modern and fully responsive for private albums, modern, rap, devotion, movie songs etc. These give you the power to create amazing websites for the music lover. You can easily customize them according to your needs and change them to a unique creation. Elvis design infused with trendy colors makes this stylish template a perfect fit for an entertainment music website, that you want to get immediate attention online. Elvis is a clean, Flat Responsive Bootstrap Template for music portal websites like Movie songs, private albums, Rap, Devotional, modern etc. This template is built in a Fancy style, sleek design and easy to customize. Elvis built with a clean flat grid system using HTML5 and CSS3 which looks great on all devices. 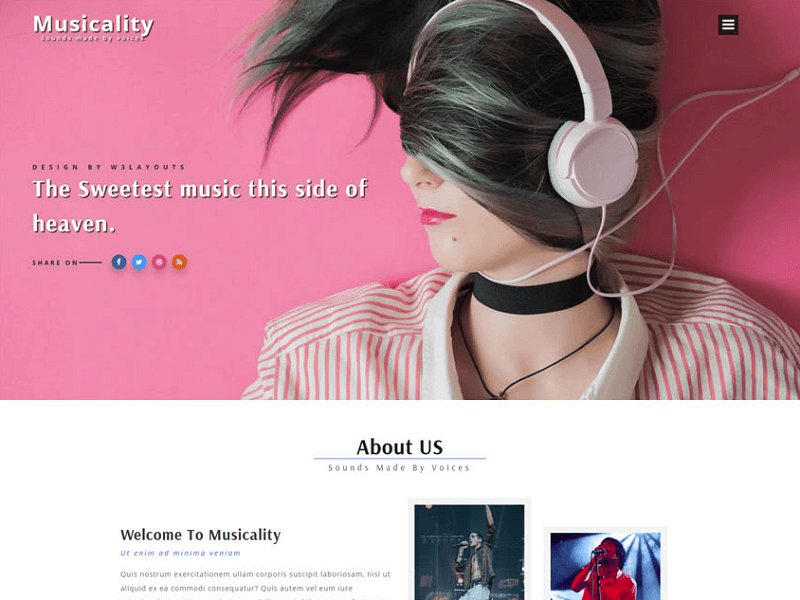 Musicality is an entertainment-themed multipurpose template, the best choice for all your entertainment or music related websites in order to boost your online presence and expand your business around the world via online by using this modern and elegantly designed template. This smartly designed template has awesome features like animated banner text, nice hover effects, animated navigation menu button, smooth scrolling navigation, lightbox effect, carousel slider and clean, sleek, minimalistic and elegant style of design in every detail. 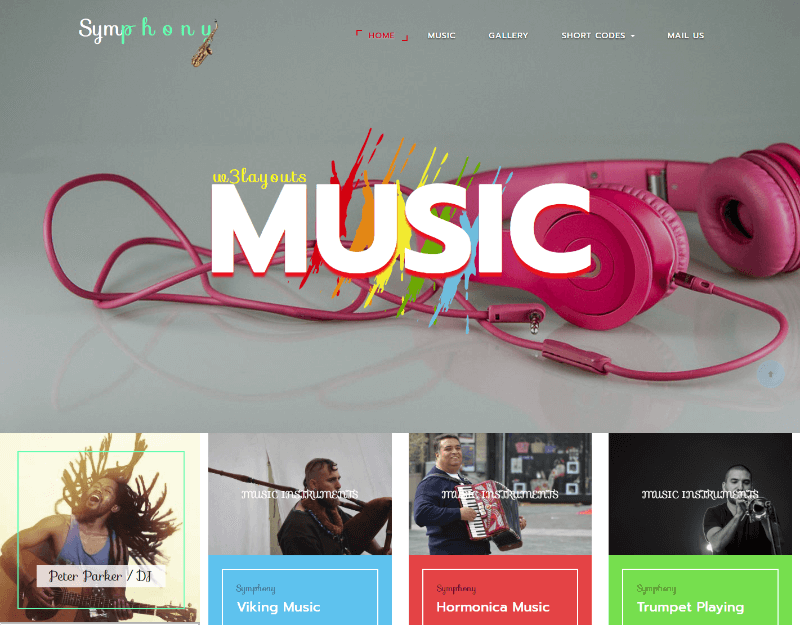 Symphony is a beautifully designed music themed multipurpose template, a perfect choice for all your music related websites like Studio, musicians, artists, music bands, producers or anyone working in the music industry, Audio, Radio websites,label, webzine, discography, events, photo galNightclubclub owner, events producer, party, radio station, entertainment magazine, club music fans, vocal performers, Music event organizers, Nightclub, Concert or festival websites and much more. A perfect show-stopper! An Entertainment Category Flat Bootstrap Responsive Website Template and undoubtedly steals the show with its effervescent design. This entertaining multi-page template is designed using HTML5, CSS3, and Bootstrap framework. Mosaic is an enticing composition garnered with a legion of widgets and features that makes your business website much entertaining for your target customers. 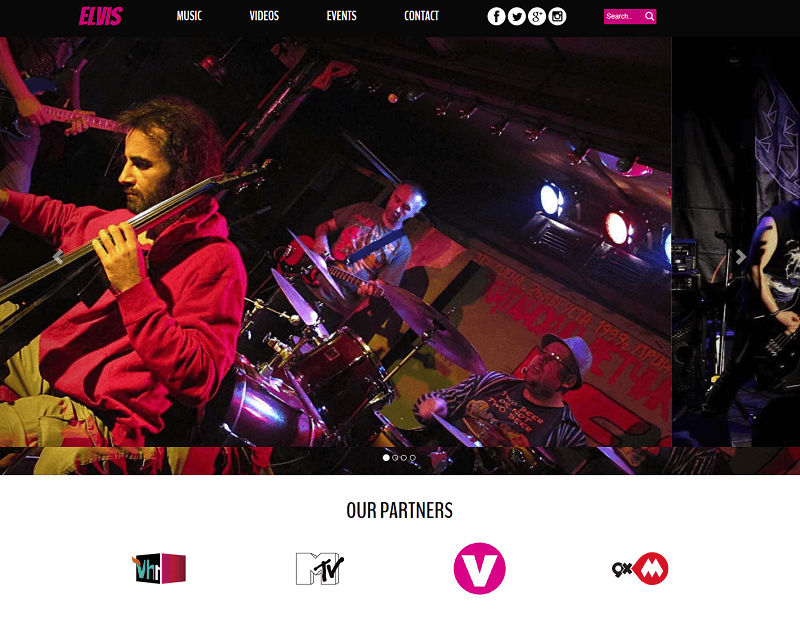 A Music category Flat Bootstrap Responsive Website Template built Gloriously. 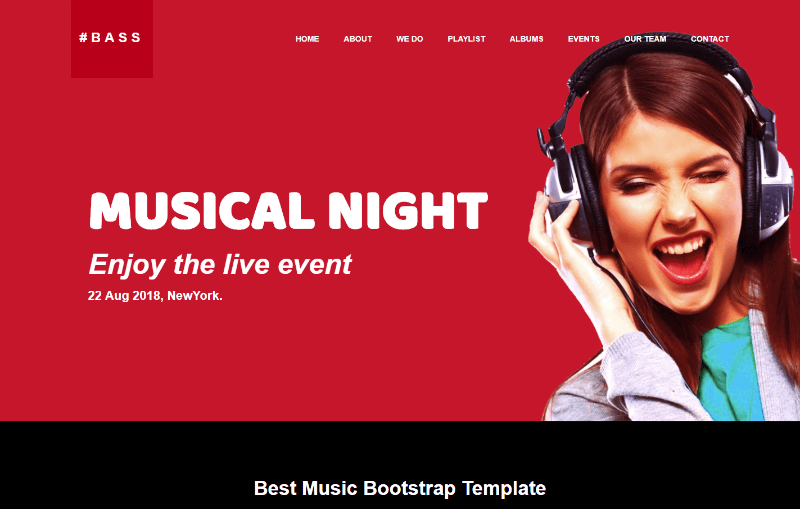 This Single-page Responsive Template is designed using HTML5, CSS3, and Bootstrap framework and can Exert for your Music / Orchestra / Band / Pop-Albums / Entertainment category business Website. The Vibrant Colors, Clean Alignment, Parallax Images, Hover Animations, and Pop-up Video Player Synchronized well to bring out this Pulsating Responsive Web Template. 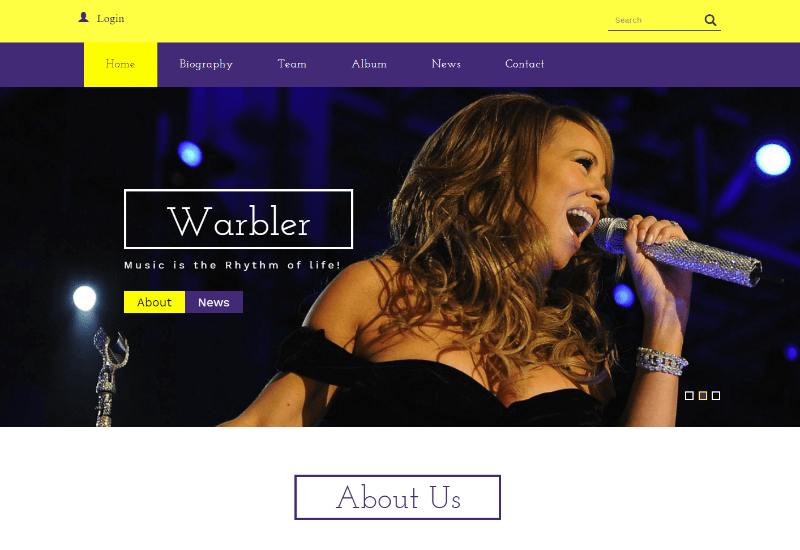 An Entertainment category Flat Bootstrap Responsive Website Template built profoundly. This multi-page Responsive Template is designed using HTML5, CSS3, and Bootstrap framework and can exert for your Music / Orchestra / Band / Pop-Albums / Entertainment category business Website. The Vibrant Colors, Stunning Images, Navigation bar, Hover Animations, and Clean Alignment Synchronized well to bring out this Pulsating Responsive Web Template. Music Life design infused with trendy colors makes this stylish template a perfect fit for an entertainment music website, that you want to get immediate attention online. Music Life is a clean, Flat Responsive Bootstrap Template for music portal websites like Movie songs, private albums, Rap, Devotional, modern etc. This template is built in a Fancy style, sleek design and easy to customize. Get this Flat Responsive HTML5 Template and make your entertainment website look like it was custom created specifically for your needs. Music 8 design infused with trendy colors makes this stylish template a perfect fit for an entertainment music website, that you want to get immediate attention to online. Music 8 is a clean, Flat Responsive Bootstrap Template for music portal websites like Movie songs, private albums, Rap, Devotional, modern etc. This template is built in a Fancy style, sleek design and easy to customize. Music 8 built with a clean flat grid system using HTML5 and CSS3 which looks great on all devices. 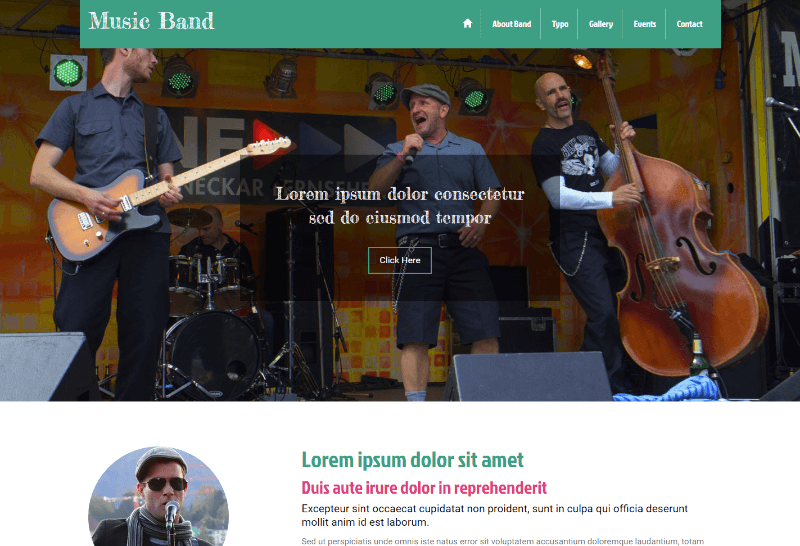 Music Band design infused with trendy colors makes this stylish template a perfect fit for an entertainment music website, that you want to get immediate attention to online. This template is built in a Fancy style, sleek design and easy to customize. Music Band is a clean, Flat Responsive Bootstrap Template for music portal websites like Movie songs, private albums, Rap, Devotional, modern etc. Music Mix design infused with trendy colors makes this stylish template a perfect fit for an entertainment music website, that you want to get immediate attention to online. 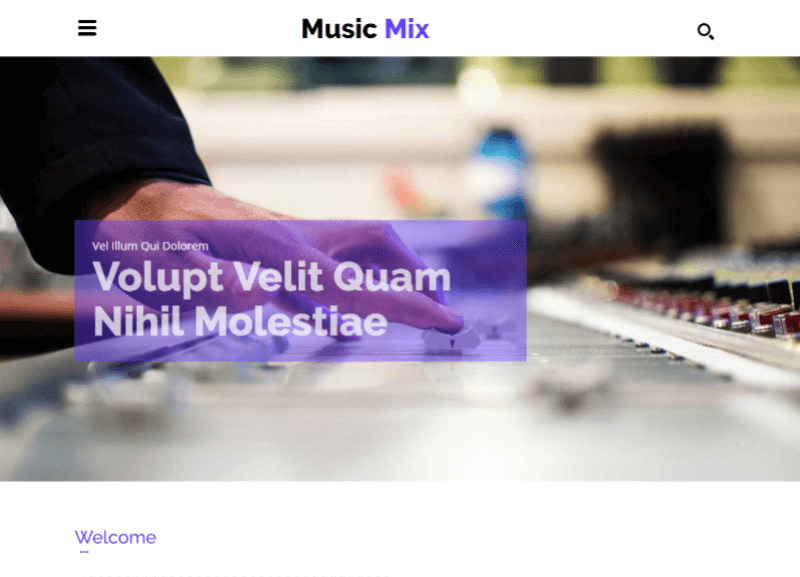 Music Mix is a clean, Flat Responsive Bootstrap Template for music portal websites like Movie songs, private albums, Rap, Devotional, modern etc. Get this Flat Responsive HTML5 Template and make your entertainment website look like it was custom created specifically for your needs. Boombox design infused with trendy colors makes this stylish template a perfect fit for an entertainment music website, that you want to get immediate attention to online. This template is built in a Fancy style, sleek design and easy to customize. Get this Flat Responsive HTML5 Template and make your entertainment website look like it was custom created specifically for your needs. 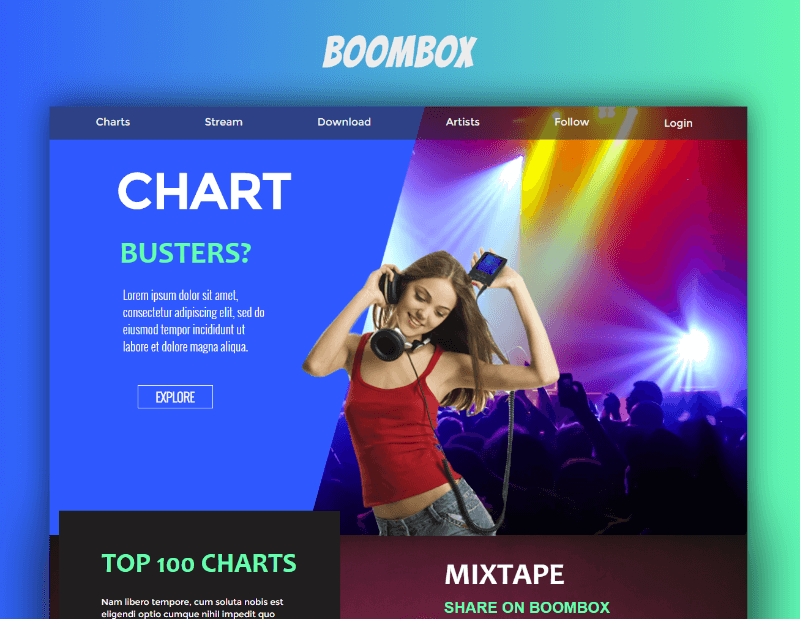 Boombox is a clean, Flat Responsive Bootstrap Template for music portal websites like Movie songs, private albums, Rap, Devotional, modern etc. Music World design infused with trendy colors makes this stylish template a perfect fit for an entertainment music website, that you want to get immediate attention to online. Music World is a clean, Flat Responsive Bootstrap Template for music portal websites like Movie songs, private albums, Rap, Devotional, modern etc. 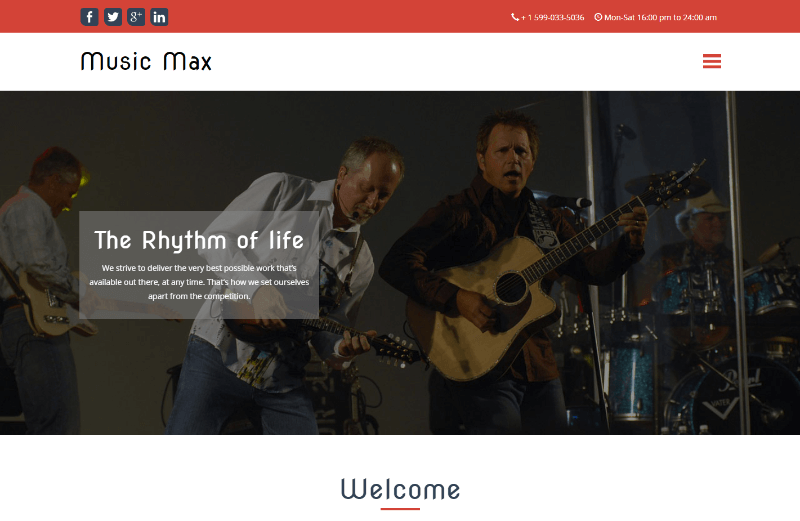 One of the best free music HTML website templates. This template is built in a Fancy style, sleek design and easy to customize. Music Club design infused with trendy colors makes this stylish template a perfect fit for an entertainment music website, that you want to get immediate attention to online. Melody is a clean, Flat Responsive Bootstrap Template for music portal websites like Movie songs, private albums, Rap, Devotional, modern etc. One of the best free music HTML website templates. 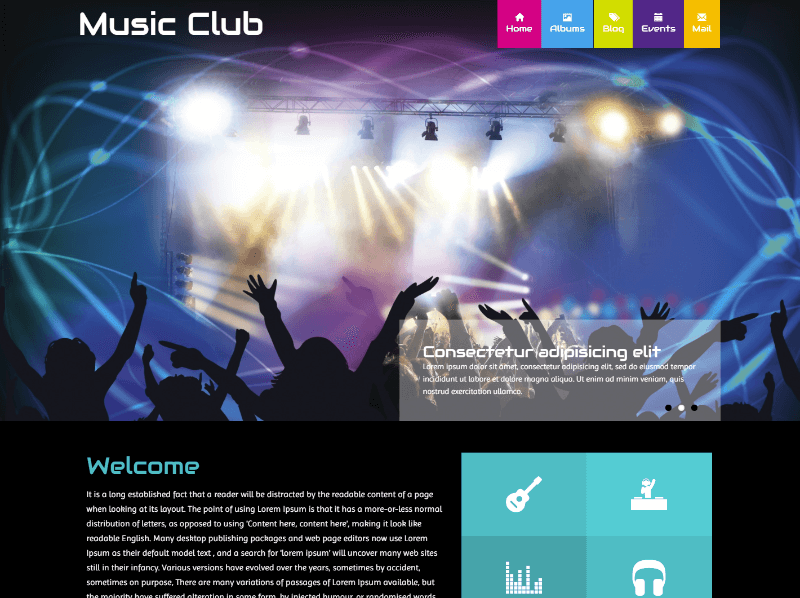 Music Club built a clean flat grid system using HTML5 and CSS3 which looks great on all devices. Melody design infused with trendy colors makes this stylish template a perfect fit for an entertainment music website, that you want to get immediate attention to online. Melody is a clean, Flat Responsive Bootstrap Template for music portal websites like Movie songs, private albums, Rap, Devotional, modern etc. 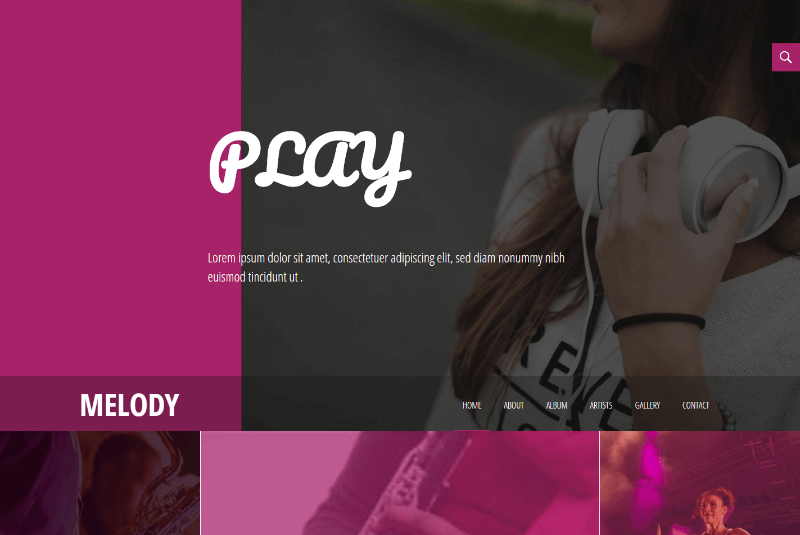 Melody built with a clean flat grid system using HTML5 and CSS3 which looks great on all devices. Get this Flat Responsive HTML5 Template and make your entertainment website look like it was custom created specifically for your needs. 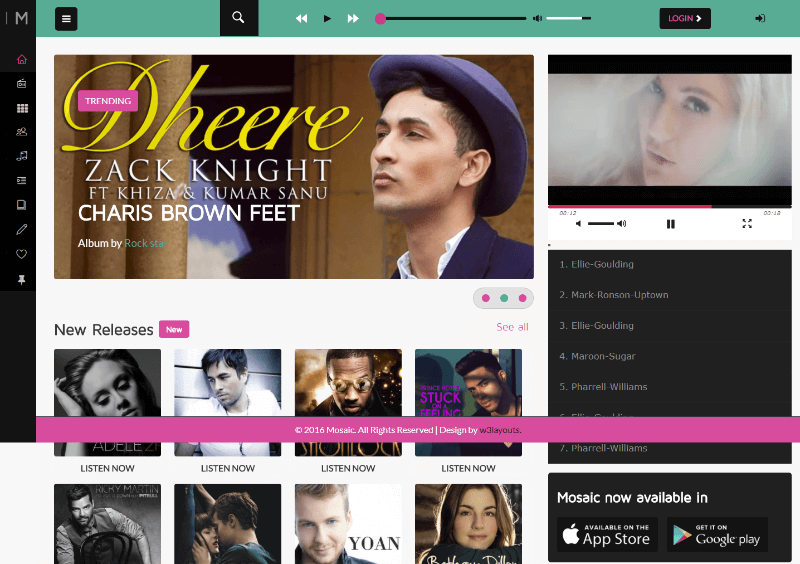 Music Entertainment Mobile web template can be used to start a website for Movie related online music store, online videos stores like raaga, Grooveshark and so on. For these websites, Responsive slider, lightbox plugin for web and Mobile Templates are used. 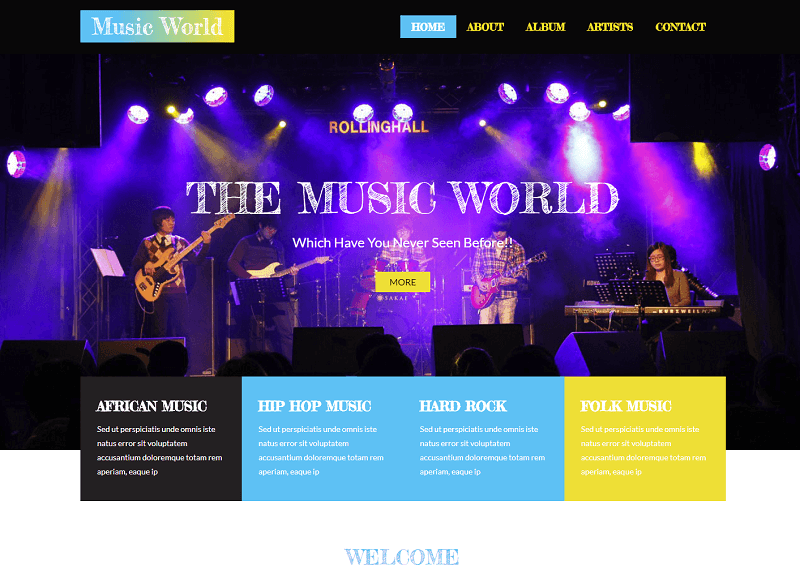 One of the best free music HTML website templates. This template supports all browsers, Mobile phones. It provides three different designs for different browsers if you are planning for an only mobile site for smartphones like iPhone, Android and others use smartphone template. 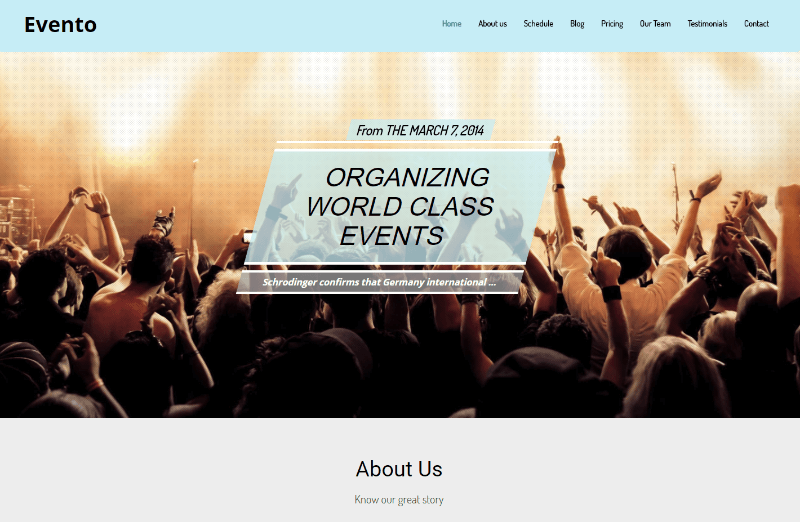 Event Management Website Template is a flat clean modern and stylish bootstrap theme suitable for small types of business such as music, entertainment, events, and many others. The template is fully responsive and mobile-ready. One of the best free music HTML website templates. It has the ability to function faultlessly on all types of browsers and modern devices and adapts suitably to small, big or widescreen resolutions. Bass Music Website Template is a flat clean modern and stylish bootstrap theme suitable for small types of businesses such as music, entertainment, events, and many others. 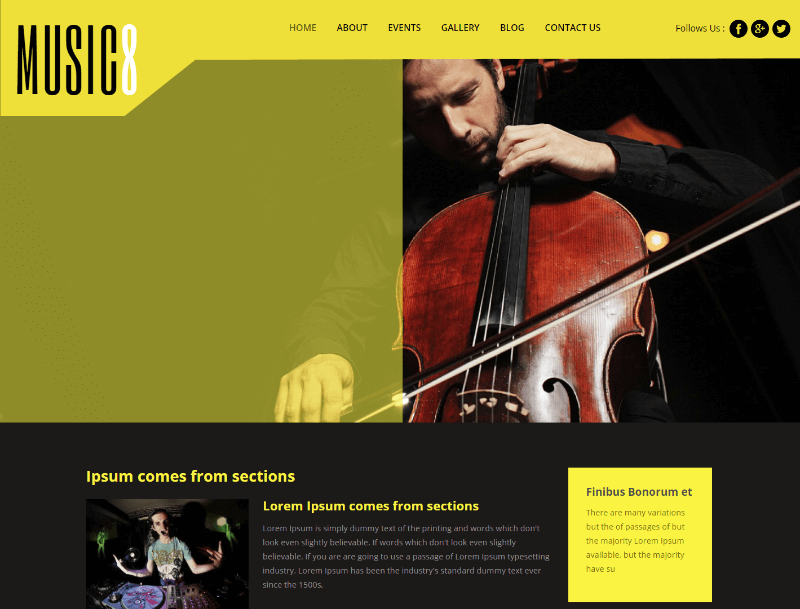 One of the best free music HTML website templates. The template is fully responsive and mobile-ready. It has the ability to function faultlessly on all types of browsers and modern devices and adapts suitably to small, big or widescreen resolutions. 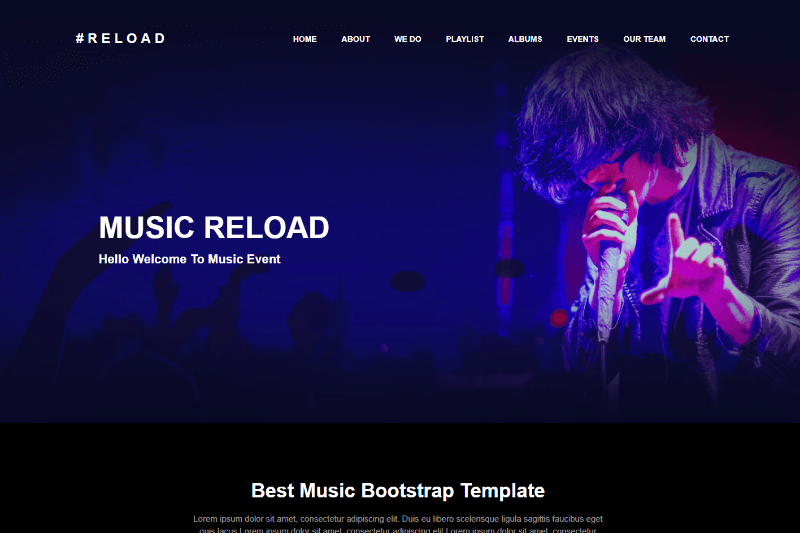 Reload Music Event Bootstrap HTML Template is a flat clean modern and stylish bootstrap theme suitable for small types of businesses such as music, entertainment, events, and many others. 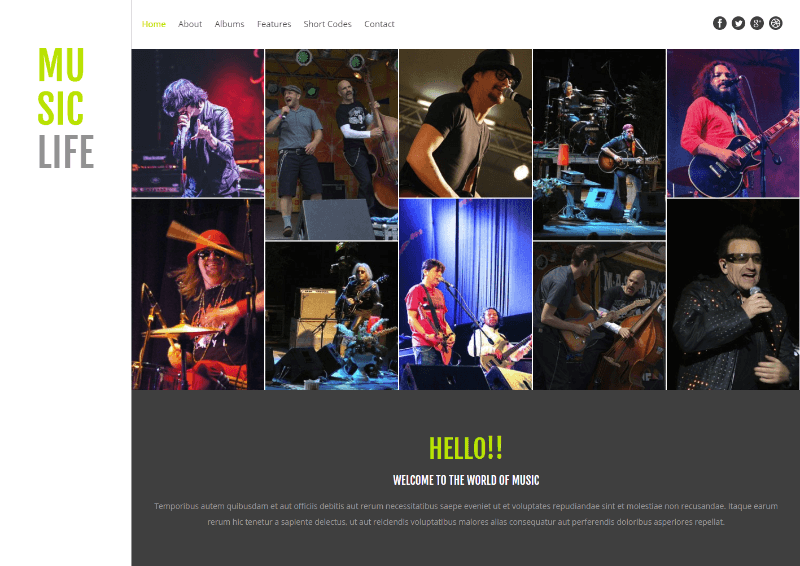 One of the best free music HTML website templates. The template is fully responsive and mobile-ready. It has the ability to function faultlessly on all types of browsers and modern devices and adapts suitably to small, big or widescreen resolutions. 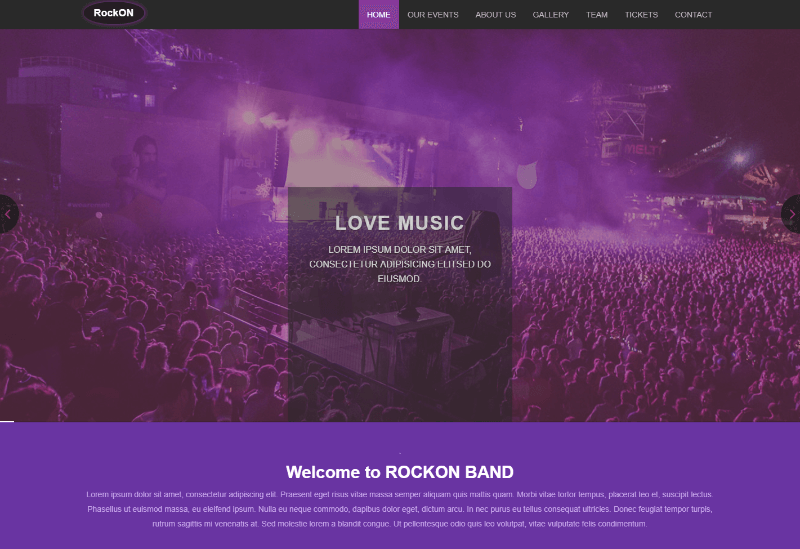 Rockon Free Music Bootstrap Web Template is a flat clean modern and stylish bootstrap theme suitable for small types of businesses such as music, entertainment, events, and many others. The template is fully responsive and mobile-ready. One of the best free music HTML website templates. It has the ability to function faultlessly on all types of browsers and modern devices and adapts suitably to small, big or widescreen resolutions. This template is built using the latest Bootstrap framework with html5 and css3 which is very easy to customize. 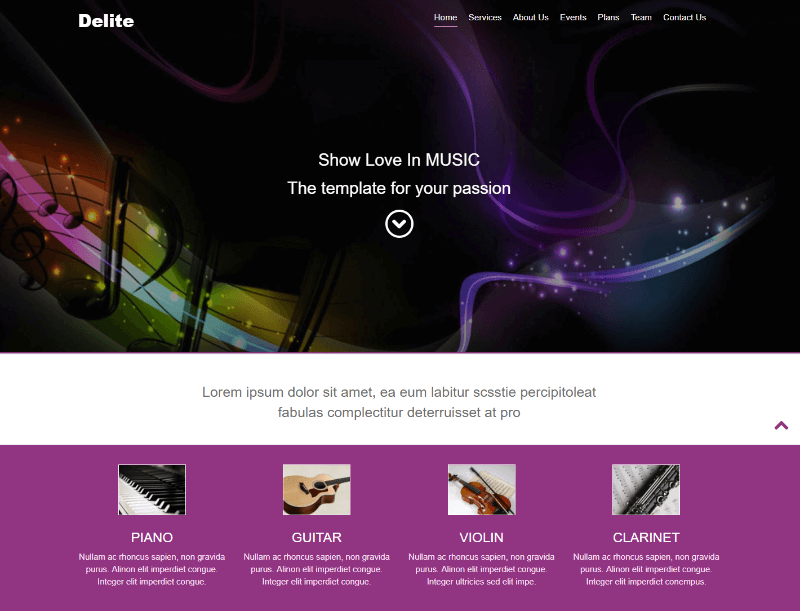 Delite is the modern Music website template designed for all the Music, Band, Club, Party, personal portfolio and Consultants out there that need a professional yet modern looking website. One of the best free music HTML website templates. This HTML template comes packed with features and enables them to interact easier. This is developed on HTML5, Bootstrap 3.2.0 and fully Responsive site template. 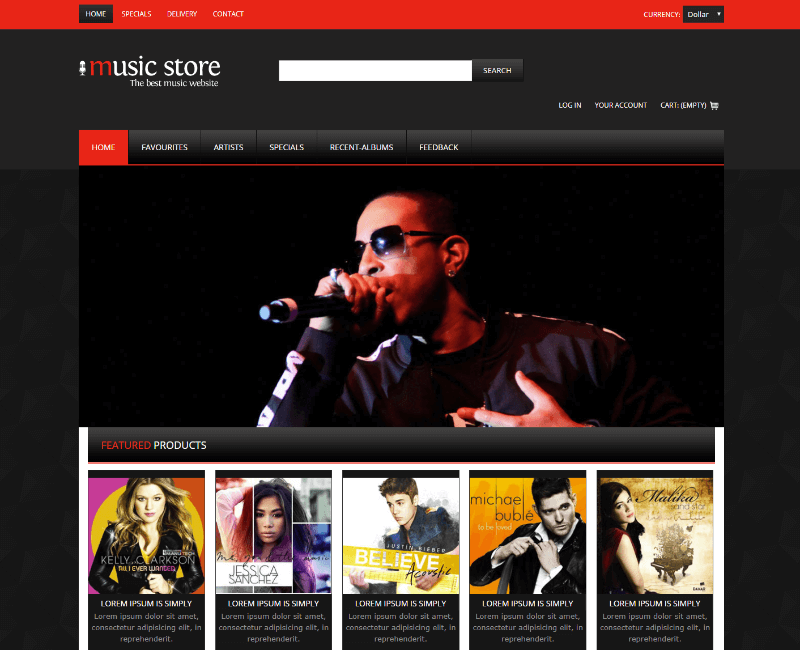 MusicX online music Entertainment Mobile web template can be used to start a website for Movie related online music store, online videos stores like raaga, Grooveshark or else. we are using a Responsive slider, lightbox plugin for web and Mobile Templates. This template supports all browsers, Mobile phones. Provided three different designs for different browsers if you are planning for an only mobile site for smartphones like iPhone, Android and others use smartphone template. This template supports all browsers, Mobile phones. Provided three different designs for different browsers if you are planning for an only mobile site for smartphones like iPhone, Android and others use smartphone template. Music Box online music Entertainment Mobile web template can be used to start a website for Movie related online music store, online videos stores like raaga, Grooveshark or else. 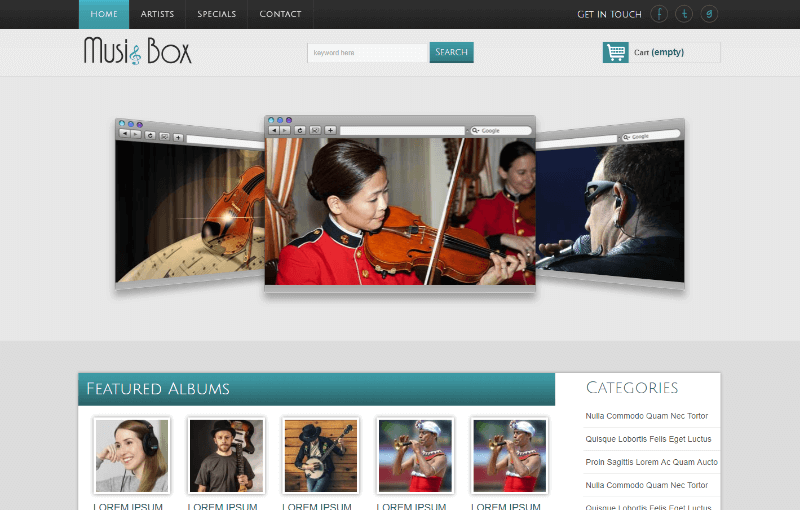 we are using a Responsive slider, lightbox plugin for web and Mobile Templates. One of the best free music HTML website templates. 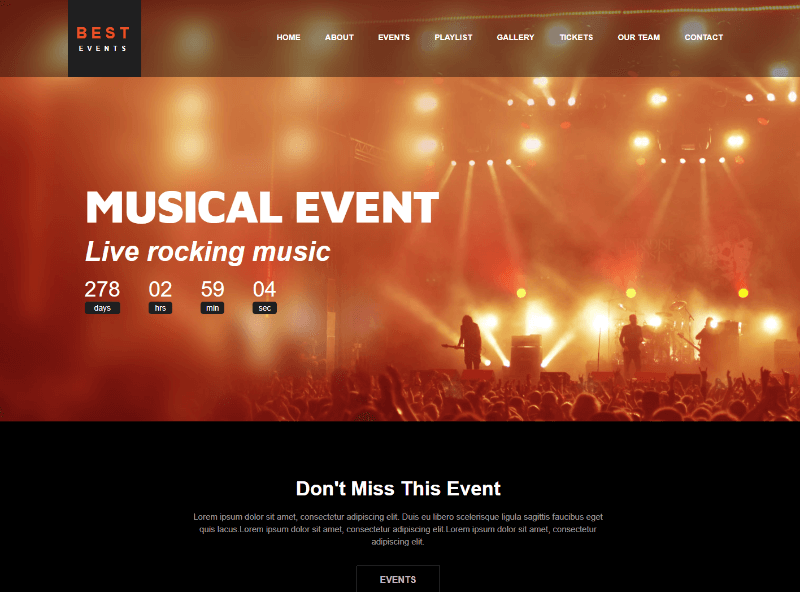 Evento – A free responsive one-page event website template! This is completely a free responsive bootstrap. Template designed with Bootstrap, the best CSS framework, HTML5, and CSS3. Using this responsive one-page event template you can achieve more success in your next big game. 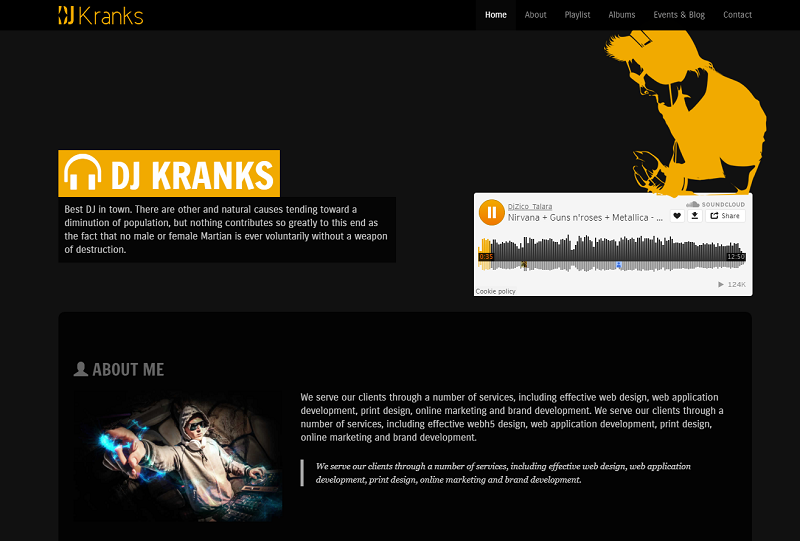 Dj Kranks is the modern Music website template designed for all the Music, Band, Club, Party, personal portfolio and Consultants out there that need a professional yet modern looking website. This HTML template comes packed with features and enables them to interact easier. One of the best free music HTML website templates. This is developed on HTML5, Bootstrap 3.2.0 and fully Responsive site template. 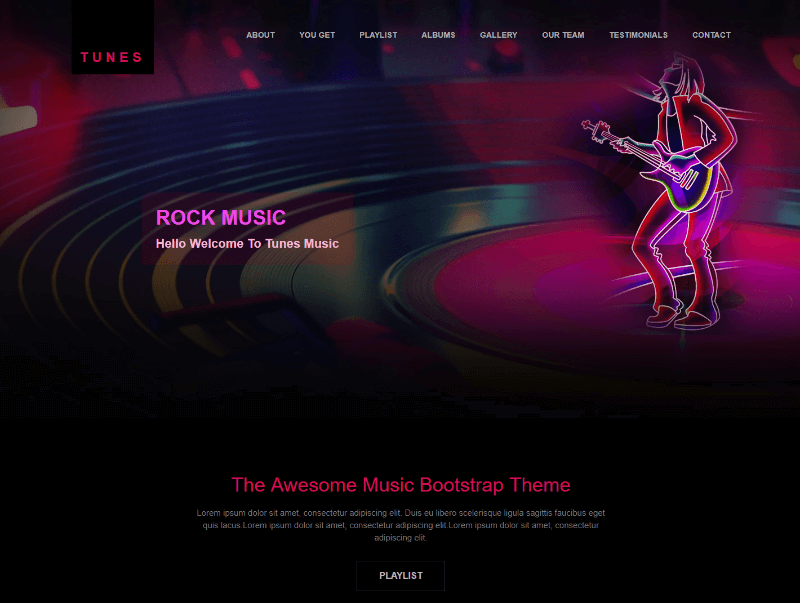 Tunes Music Website Free HTML Template is a flat clean modern and stylish bootstrap theme suitable for small types of businesses such as music, entertainment, events, and many others. The template is fully responsive and mobile-ready. It has the ability to function faultlessly on all types of browsers and modern devices and adapts suitably to small, big or widescreen resolutions. This template is built using the latest Bootstrap framework with html5 and css3 which is very easy to customize.